Following great enthusiasm and success, the Hyde Park Art Center was pleased to present the third installment of Not Just Another Pretty Face (NJAPF), a commissioning project. This dynamic year-long program began with the Center arranging commissions between patrons and artists. The result was a group of engaging and personal works (from traditional to most untraditional) culminating in a grand unveiling benefit event, an exhibition in Gallery 1, a catalogue documenting the process, and a series of free public programs exploring the idea of collecting art. The 2007 year of Not Just Another Pretty Face had created an interesting, accessible, and personal way to participate in collecting contemporary art as well as an opportunity to learn about the broad and creative pool of contemporary artists working in Chicago. 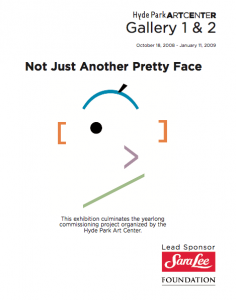 The 2007 year of Not Just Another Pretty Face had created an interesting, accessible, and personal way to participate in collecting contemporary art as well as an opportunity to learn about the broad and creative pool of contemporary artists working in Chicago. 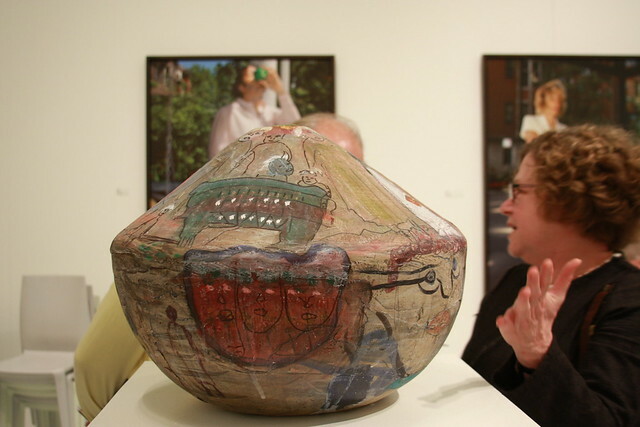 Throughout the course of NJAPF‘s events and programs, a new and diverse group of people have begun to think of themselves as patrons of contemporary art and have, with the assistance of the Center, started building lasting relationships with artists. NJAPF also provides all of the artists involved with greater exposure to a wider audience and the possibility of inclusion in a major exhibition and catalogue. The Art Center is proud to be a facilitator of these new creative interactions and to be instrumental in bringing about new situations for creativity. Cousandra Armstrong, Floyd Atkins, Paul Benjamin, Marie Krane Bergman, Dalton Brown, Gillion Carrara, Nick Cave, Juan Angel Chavez, Stan Chisholm, Cat Chow, Lexi Coffee, Luis De LaTorre, Brian Dettmer, Brian K. Ellison, Ted Feaster, Jane Fulton Alt, Anthony Gassaway, Theaster Gates, Jr., Benjamin Gest, Ron Gordon, Ethan Green, Jennifer Greenburg, Cynt Grover, Jacob Hashimoto, Juarez Hawkins, Bette Cerf Hill, John Himmelfarb, Isadore Howard, Carol Jackson, Marva Pitchford Jolly, Jackie Kazarian, Makeba Kedem-DuBose, Yashua Klos, Anna Kunz, Christian Kuras, Cydney Lewis, Lisa Lindvay, Michelle Litvin, Duncan MacKenzie, Danny Mansmith, Kathleen McCarthy, Geraldine McCullough, Tony Philips, Judith Raphael, Karen Reimer, Darrell Roberts, Joanne Scott, Mary Seyfarth, G.L. Smothers, Sarah Stec, Pearlie Taylor, Antonio Wade, Dale Washington, Oli Watt, Julian Williams, Karl Wirsum, Scott Wolniak, and Mary Lou Zelazny. Harry and Susan Arader, Robert Ashenhurst and Nancy Levner, Barbara Bates, Paul Benjamin, Cynthia Bowman, Markell Bridges, Darwin F. Brown, Laurie Burgess, Cleve Carney, Karen Carter and Brad Lynch, Bruce and Martha Clinton, Colleen Coyne, Dan Delany, Linda Dunn, Jennifer and Kurt Elling, Linda Erf Swift, Ciaran Escoffery, Ginger Farley and Bob Shapiro, Demetrius Few, Curran Filer, Nancy Fishman, John and Julie Guida, Courtney Harris, Gary Heiferman and Paul Buenvenida, Gail and Tom Hodges, Ruth Horwitch, Brooke Hummer and Grove Mower, Lois Iseminger, Deone Jackman and Eugene Goldwasser, Kineret Jaffe and Morton Silverman, Christina Jensen, Justine Jentes and Daniel Kuruna, Chet Kamin and Nancy Schaefer, Janis Kanter and Tom McCormick, Lisa Key, Jacque and Elliott Kieff, Paul Klein and Amy Crum, Todd Lewis, Kate Lorenz, Jill and Michael Lowe, Claudia Luebbers, Sonya Malunda and E. Charles Lampley, Talmadge Mason, Patric McCoy, Lauren Moltz and John Clement, Susan and Ralph Muller, Daniel Parker, Leslee Patras. Sandra and Michael Perlow, Robert Rizzo, Margie Roman, Jason A. Saul, Lindsay Schmid and Nick Alexander, Linda Searl and Joe Valerio, Ross and Cimi Silverberg, D.E. Simmons, Judith Stein, Irving Stenn, Scott and Kim Stiffle, Charles Thurow, Jennifer A. Turner, Rachel Tuuri, Ron West, Pirfirco Williams, Karen G. Wilson, Richard Wright, and Michele Yeadon. Additionally, a catalog was produced in conjunction with the exhibition. Contact exhibitions@hydeparkart.org to purchase a copy.